Underneath our clothes, there’s a story etched onto our skin, and tattoos are just one of the many ways to tell that story. It can be a part of your philosophy, a reminder, or just a way to express yourself. It’s something that’s intimate and personal. Or maybe it’s something that just looks nice and that could be reason enough. What makes tattoos so fascinating are how they’re a visual snippet of someone’s life. 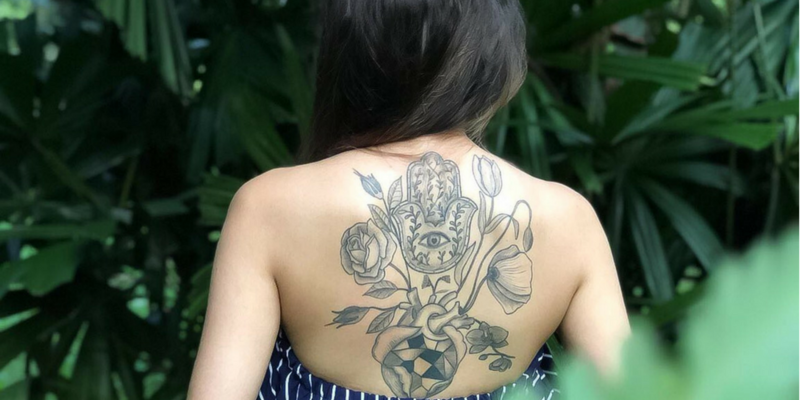 So, we got 8 millennials to share the stories behind their tattoos and what does it mean to them. I grew up always wanting a tattoo. If someone with one walked past me, I’d always take a second to admire it, because tattoos are a personal choice, and that’s why I got mine. I’ve always been a science geek for as long as I can remember. I especially love astronomy, because of it reminds me just how big our universe really is. Getting a tattoo to commemorate that love brought me so much joy. The Sun is in the center to remind myself that I’m my first priority, and that nothing and no one should get in the way of what I think is best for me. That’s what it means, translated from Elvish. I’ve always wanted a tattoo, and one day I just randomly thought of learning the Elvish language from the Lord of the Rings series. Since I was a kid, it was my favourite movie, so it made sense to me. It wasn’t an easy language to learn, because it has its own dialects too. The saying was always repeated to me by my rugby coach, and it guided me throughout the ups and downs of my life. It’s something that I live by, and also a constant reminder to move forward to bigger things. The flowers are a tribute to my partner and my other half. Before him, my life was just getting through the mundane ins and outs of life, but when he found me, he changed everything about me. My world, my views, and my opinions. It was the flowers that bloomed in my heart. These flowers weren’t meant to fade with time, and that’s why I had it etched on my skin in all of its beauty on my back. Each flower means something to the both of us, and now it’s permanently on my skin to tell us how we’ve come together. I got this through a friend of mine who does stick and poke tattoos, and it was an interesting and intimate process too. The bicycle tattoo was to commemorate my first mode of transport as a kid. Nothing beat going around KL on two wheels, and I cycled everywhere I went. My memories of growing up were spent on my bike, sweat on my back, and wind in my hair. Since, it was my first tattoo, I wanted it someplace discreet, and it made sense to put it on my leg too. Pedal power! I got it while I was in London when the refugee crisis was escalating in Germany. There was this project called “Tattoo for Equality” by Monty Richthofen to raise social awareness. The tattoo was free, and so you know, why not? I was nervous on the day, but I was excited by the idea of meeting people that shared my mentality, and the conversations that I would have. Being connected by the same tattoo by people I haven’t met yet feels great too. My tattoo is a reminder of my own privilege. It reminds me to put myself in the other’s shoes, and to be aware of the issues–it reminds me to stay angry and to stand up for myself, and for the people who can’t. I had it tattooed above my ankle, to remind myself of my privilege with every step I take. To me, my tattoo is a reminder. I’m a pessimist. I always think of the worst possible outcome, and it gets so hard to outrun my own negativity. Sometimes, the stress and the anxiety of working in a startup and the fear of failing takes its toll on me. I’d have trouble sleeping, because I’m obsessing about something completely out of my control. I got my tattoo to remind myself to appreciate the little things in my life, and to look at the brighter side of things. Memento Mori also means that I should learn to enjoy the ride. Because in life, it’s not just about the destination. You have to enjoy the journey getting there. As for where I tattooed it, it’s because if worse comes to worse, and I ever thought about cutting myself, I’d have to face this reminder I made for myself. It’s from A Midsummer Night’s Dream by Shakespeare. It might sound like it’s a quote about true love, but to me, it’s about understanding true beauty. It came to me when I came across the works of Peter-Joel Witkin. His photos have so much to unpack. There’s a story behind them that you’d have to understand to really appreciate it. And it’s that kind of art that I want to create as a fashion designer. I draw inspiration from stories when I design clothes. The style, colours, and the overall feel. I try to tell a story with my clothes, because I believe that art isn’t just visual, but something that should be understood. I’ve always meant my tattoo to be private, because it’s important to me, but it’s not something for others to see. My tattoos allow me to showcase my personality without me having to say anything, because I’m an introvert. It’s my way to show people who I am. My arm is covered with abstract tattoos. There are hexagons which are my favourite shape, owls because I’m a night owl, a wolf which represents my adaptability, and a capricorn because that’s my horoscope. I love the wilderness, because it lets me reminisce on my childhood as a kampung boy. I spent a lot of my time outdoors, and I still do since my work as a facilitator allows me to teach about the importance of nature conservation. That’s why I chose so many animal designs, because nature is something I hold dear to me. There’s so many reasons to get a tattoo. It might be because it resonates with your own ideals, it could be a reminder, or just something purely aesthetic–but it’ll always be a form of self-expression, and it’ll be one of the most intimate and personal ways to.